What generation do you consider yourself from? Post “Baby-boomer”, it seems like everyone has their own set of dates that determine whether they’re really Generation X, Y, Z or Millennial. Others have based this on pop culture values or trends from their childhood. For me, who knows? I think I’m “X” although I’ve been told “Y”. Why? Couldn’t tell ya’. So as some of us continue to ponder whether or not we’re part of Generation X, Y,or Z in America (yes, it is an American thing) I have learned that the Japanese don’t name their generations or eras like us. Why would they, they’re Japanese? For example, we are all living in the Heisei period (1989-Present) but my wife, myself, her parents and her grandparents were all born in the Showa period (1926-1989). When your watching Samurai movies dated in “Feudal Japan” most likely it’s a story that takes place between the Kamakura period and Azuchi-Momoyama period (1185 – 1603). 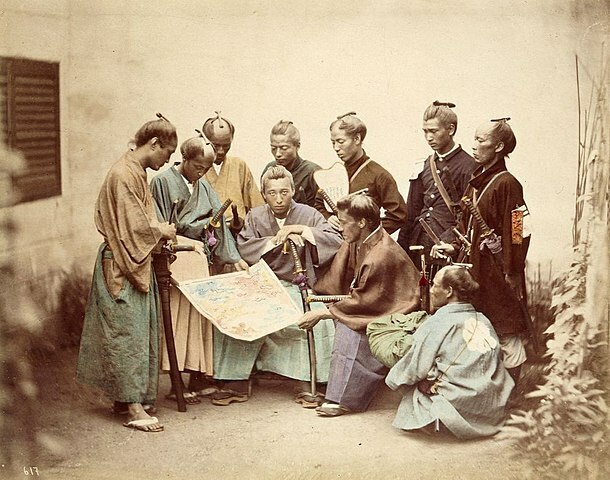 Immediately after were the Edo (1603 – 1868) and Meiji periods (1868 – 1912). The Kamakura period was named as such because the city was the center of power for the Kamakura shogunate. The Azuchi-Momoyama periods are named for the castle Azuchi and the castle Momoyama that were both considered to be very powerful. Edo, the new capital city back then, is the former name of Tokyo while Meiji was the name of the Emperor who brought about changes that evolved into what we consider modern Japan. Heisei means, “Achieving Peace” or “Peace and Accomplishment”. So with this kind of rationale, could Presidencies be considered as eras? We live in the Obama Period which was preceded by the Bush Period? Never mind, that doesn’t sound pleasant at all. So fellow Heisei-ers, what generation are you? Author hikikomori78Posted on May 26, 2013 May 15, 2013 Categories Film, Japan, UncategorizedTags Azuchi–Momoyama period, isolation, Japan, Kamakura, Kamakura period, Kamakura shogunate, loneliness movie, Meiji period, United StatesLeave a comment on Generation who? 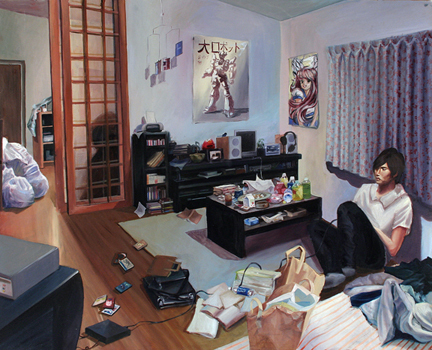 Asking the natives: What is a Hikikomori? My wife’s friends were more than happy to tell me about Hikikomori and their own personal experiences with the phenomenon. To date, I haven’t convinced any of them to go on camera and explain it in their own words. So, instead, I thought I’d share something I came across during my research. Japan Channel.Com is one foreigner’s perspective of Japan, most videos are based on his life in the land of the rising sun and his personal experiences. Most of his videos are observations or personal commentary, however they are still full of a lot of useful information and perspectives for anyone thinking about visiting or living over there. “TheJapanChannel.com is for people who are interested in all sorts of stuff from Japan. I really enjoyed his interview videos with his friends. Check out his video about Hikikomori. During my web surfing I came across this track by a group named Silicone Soul also named, Hikikomori. It’s not bad, kinda reminds me of Tangerine Dream or some other progressive music from the 80’s. Author hikikomori78Posted on May 19, 2013 May 14, 2013 Categories Film, Hikikomori, Japan, UncategorizedTags Culture of Japan, Facebook, hikikomori, isolation, Japan, Japanese language, loneliness movie, Music of Japan, Silicone Soul, Tangerine Dream1 Comment on Asking the natives: What is a Hikikomori? Rejection: It’s A Part Of The Creative Process Just As Much As Breathing Is A Part Of Life. When you choose to make a film or do anything creative you are destined for an abundance of rejection. It’s a part of the creative process just as much as breathing is a part of life. Knowing this doesn’t make accepting rejection any easier. No one wants to be rejected. Still, it can be healthy for our social growth and development if we have the proper outlook. 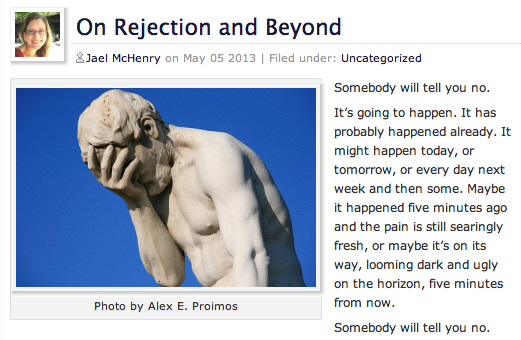 Jael McHenry’s article, “On Rejection and Beyond,” sums this up quite nicely. The article was originally written for her readers on Writers Unboxed.com but I thought I’d share, anyway. It’s a good quick read. You’ve got to “Keep on, keepin’ on..” Why? Because no one is ever going to “let” you do what you want. So, you have to figure out that alternate route in getting there. Ultimately, it’s people’s opinions about you or your work that are making these decisions of rejection. Well, everyone has an opinion about something. And do we all agree? Author hikikomori78Posted on May 12, 2013 May 6, 2013 Categories Film, UncategorizedTags art, Creativity, hikikomori, japanese, loneliness movie, Rejection, Writer Resources, WritingLeave a comment on Rejection: It’s A Part Of The Creative Process Just As Much As Breathing Is A Part Of Life. Don’t worry. We’re still pulling elements of our film together. I read another article I wanted share. This time it’s from a blog called “English Bento Box”. Go on to the full blog entry here. 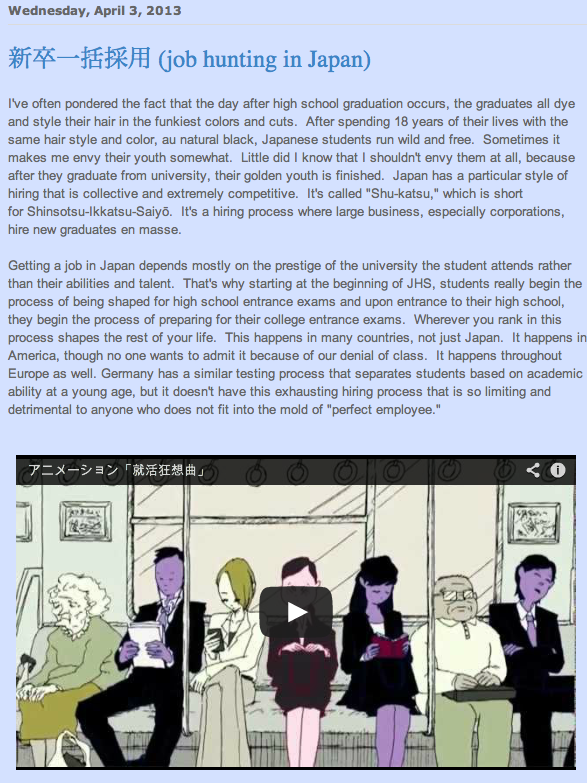 In Japan, one thing my wife and her friends have expressed time and time again is the over whelming pressure to gain full time employment immediately after college. For women, this has proven to be even more crucial in having any form of a stable career / life. Sexism and ageism in Japan is (by modern American standards) completely baffling and frustrating to me. For men and women over the age of twenty-five, if you haven’t buckled in for that thirty year tenure… you’re doomed. Bouncing around from job to job is frowned upon there. Once you’re hired at a company you’re expected to dedicate your life to that company for the rest of your days until retirement. If not, your career prospects become limited very quickly. It’s also generally accepted that the prestige of your university rather than your skills will determine who hires you. For women, it is expected that most will marry around twenty five and begin their families. With that in mind, most companies will not hire women in this age range and older despite the rise of single independent professional women. Maternity leave is not common, if practiced at all. Like work, you’re expected to dedicate yourself to being a mother/housewife and major companies don’t want to deal with that. Whatever “that” is. Two of my wife’s friends are already over thirty years old and know they could not find lucrative work to support themselves if they went back to Japan. Instead, they struggle to get a sponsored work visa to stay in the states where ageism doesn’t come into play until our later years. With that said, they’ve all come to realize how “American-ised” they are. And you thought looking for work in the states was a struggle.